A widely spread photo that appears to show an anti-fascist activist beating a police officer is a doctored image. 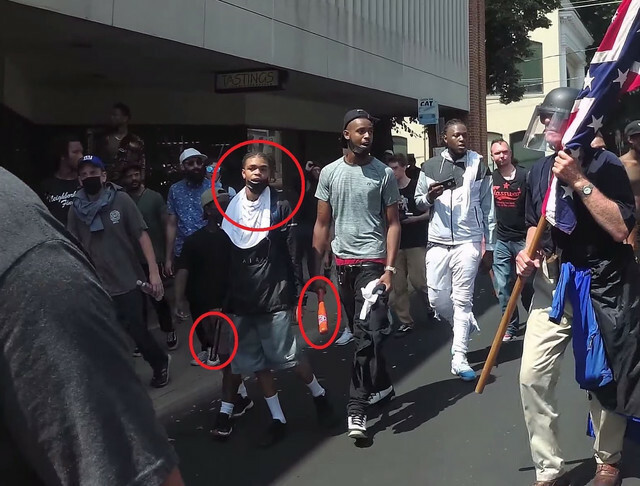 The image showing a man wielding a club and wearing an "antifa" jacket while standing over a downed officer was widely shared after the deadly violence at a white nationalist rally in Charlottesville, Virginia. The image has been circulating for several months among those opposed to the antifa movement, which is comprised of far-left-leaning militant groups that resist neo-Nazis and white supremacists. The AP doing the heavy lifting for Antifa. Is anyone surprised? Hey, don't beat me, I'm just the messenger. Personally, I'd like to see the AP and other "news" organizations investigate all the photos of all the "peaceful" Antifa protestors wielding bats and wearing helmets. Are they all doctored AP? Tell us again how "protesters" are "peaceful" if they themselves bring bats and improvised flame throwers to an event. President Trump was right to say both sides shared the blame. Anyway, posting this just for full coverage. So no one will get bogged down debating useless points. There's plenty of evidence of Antifa violence in Charlottesville. Unfortunately, this one should be discounted. Stay safe by staying informed. Communist Antifa vs. Fascist Neo-Nazi’s both are leftwing, both are socialists. So they found a similar file photo. Big deal. Those things can be faked. AP only fact checks when it suits their agenda. They have underrepresented or not reported the whole Imran Awan scandal from the start. The MSM is an arm of Antifa. Give it up AP. There are tons of videos online of these guys committing violent acts against innocent unarmed Americans just for walking into an inauguration party or going to see Ann Coulter speak. These are not brave Heroes of anything or anyone they’re violent thugs. And they’re tons of pictures of them and eyewitness reports of reporters who say that they were violent and attacking people with baseball bats down in Charlottesville. So AP what are you trying to say this is not a violent group and we’re exaggerating? There’s too much evidence they’re violent agitators. AP only fact checks when it suits their agenda. The MSM is the Country's greatest threat. Sounds like the media have declared their allegiance. Islamic terrorists are peaceful to them as well. which is comprised of far-left-leaning militant groups that resist neo-Nazis and white supremacists. And threaten a GOP group wanting to march in a parade. And attack Trump supporters. And trash property in Berkeley. And torch a limo in DC. I love how the media attempts to sanitize those goons. "which is comprised of far-left-leaning militant groups" . . . a far-left-leaning????? At the very least, every involved asset—from David Duke to Jason Kessler—needs to be exposed. It wasn’t an Antifa Thug beating a cop this time. It was some other time. Great defense AP. Look what Cernovich found. "Beats" by Dre Harris, supposed "victim" in Charlottesville. So why can't the news media see that the alt-left is the fascist, evil equivalent of the alt-right? Because they're part of it. In fact, they're central to it. They have become the propaganda arm of a fascist movement to enforce ideological orthodoxy on America - whether knowingly or unwittingly probably depends on the individual involved, but this is the prevailing culture of the media, and even the occasional conservative in their midst can't do much to slow it down. Actually no.....they are both part of the international left. Let’s shoot straight and speak the truth. Antifa and BLM have injured cops, and called for the murder of cops, which happened shortly thereafter in Dallas and New Orleans. If it is fake, then call it fake. There is no need for us to use fake pictures. The antifa is bad. There is plenty to use against them without using fake pics.